The monthly call for bloggers to participate in Wine Pairing Weekend for November came from David, who blogs at Cooking Chat. David is the founder and major organizer of the monthly food and wine pairing event. This month, our task was to come up with Creative Thanksgiving Wine Pairings. I started this month’s pairing with the food and I set several goals for the pairing. First, incorporate the familiar flavors of Thanksgiving without using turkey, mashed potatoes or candied yams. Those are the three flavors I most associate with Thanksgiving from my childhood. This is a bit embarrassing to admit, but I do enjoy cooked yams blended with baking spices and butter, then topped with miniature marshmallows and browned in the oven. It’s a dish that was always part of my family’s Thanksgiving celebration. My second goal was to keep it simple, the exact opposite of my usual Thanksgiving preparations. No cooking two turkeys. There would be no stuffing and/or dressing. I would not prepare multiple green vegetables and a salad or two. No mashed potatoes. I was, however, undecided about dessert. Third, this would be dinner for two. In past years, Thanksgiving dinner at our house might include up to 14 family members, and the dreaded “kids table”. This celebration would be just Pete and myself. Finally, no leftovers. Thanksgiving has always been as much about the leftovers as it is the main meal. Turkey sandwiches for breakfast is a tradition I really love after Thanksgiving. So, for this meal I wanted to challenge myself to make small portions. These are the ingredients for our Creative Thanksgiving Wine Pairing. My usual cutting board looks a bit empty when compared with ingredients for prior #winePW meals. 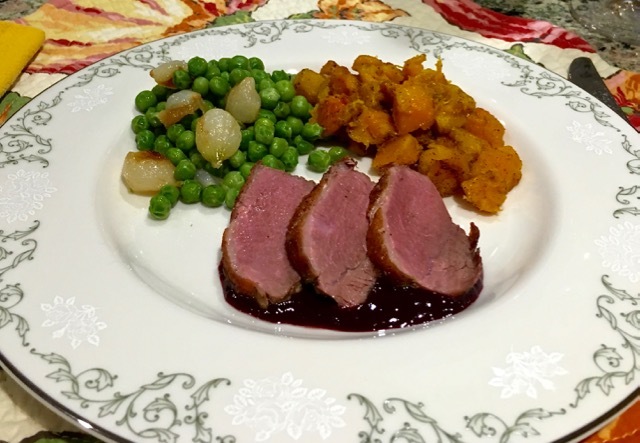 Our menu: pan-seared duck breast with a blackberry reduction, oven roasted butternut squash and peas with sautéed pearl onions. It’s simple alright, but with the proper seasoning, and the addition of ample butter, I hoped our meal would be something to be truly thankful for! The wine we chose figured prominently into how thankful we ultimately felt for this meal. The 2012 Storm Pinot Noir Moya’s was very special indeed. We were glad to have a simple meal to accompany this not-so-simple, but very elegant Pinot Noir. I started by preparing the blackberry reduction. I added a basket of blackberries and a bit of organic beef stock to a small pan. I simmered the combination for about 30 minutes, then added some aged balsamic vinegar and a teaspoon of Huckleberry jam, then continued to cook it for another 30 minutes or so. When the berries were completely cooked down, and the liquid had started to thicken, I strained the reduction through a sieve, which required a bit of pressure with the back of a spoon. While the blackberries were simmering, I prepared the butternut squash. I started by peeling and dicing one small butternut squash. Then I added a drizzle of olive oil, salt, pepper, cinnamon and nutmeg before tossing it all together and roasting it in the oven. Before plating, I mashed the roasted butternut squash with a fork and added a knob of butter. Next I sautéed pearl onions in butter and olive oil and set them aside. I cooked the peas at the last minute and stirred in the buttery pearl onions. Finally, the duck breast. This part made me a bit nervous, as I had never cooked one before. I scored the skin without cutting into the flesh of the breast, then seasoned it liberally with salt and pepper. I seared it skin side down, then repeated on the other side before popping it into a 400º F oven for a couple of minutes. We let the duck breast rest for 10 minutes before slicing it thinly. To plate each portion, I started with the peas and onions, then the roasted butternut squash. I finished with a puddle of the blackberry reduction and then several slices of the duck breast. Simple, yet delicious. 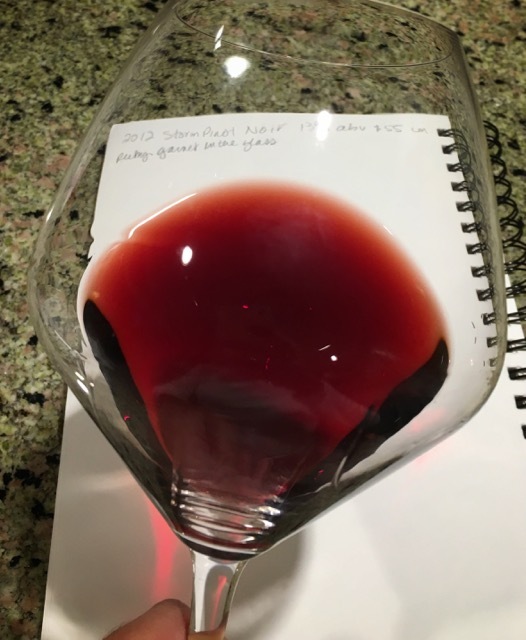 2012 Storm Pinot Noir Moya’s — medium ruby-garnet color in the glass. Damp earth and berry bramble aromas are generous. Tart cherry, blackberry and earthy flavors combine with smooth tannins for a medium-long finish. This wine has restrained fruit flavors along with earthy and even savory flavors. It is one of the most complex examples of Pinot Noir I have tasted in some time. 13% abv. I knew almost nothing about this wine before tasting it aside from a general impression of the region, Hemel-en-Aarde — that it is relatively cool, coastal and known to produce quality Chardonnay and Pinot Noir in South Africa. Hemel-en-Aarde translated from Afrikaans means heaven on earth. I have been very curious about this region since first learning the meaning of the translation several years ago. Hemel-en-Aarde is a 90 minute drive southeast from Cape Town, and we hope to visit the region next October when we return to South Africa. This lovely Pinot Noir was made by South African winemaker Hannes Storm. Working with Pinot Noir grown on a northern slope in the Upper Hemel-en-Aarde Valley, the fruit was hand harvested, de-stemmed then fermentation took place with indigenous yeast. The vineyard is relatively young, and the soil contains small rocks and decomposed granite. Before starting his own label, Hannes Storm was winemaker for 12 vintages at Hamilton Russell Vineyards also located in the Hemel-en-Aarde Valley. Hamilton Russell Vineyards is known for quality, terroir-driven Chardonnay and Pinot Noir. This 2012 Storm Pinot Noir Moya’s, along with Storm’s 2012 Pinot Noir Vrede are his first releases. He is working with two vineyards, Moya’s as described above, and Vrede which he describes as being planted in “low-vigour, stony, clay-rich shale soil in the Hemel-en-Aarde Valley”. Both are distributed in the U.S., I am happy to say. Hannes’ brother Ernst is making wine in Santa Barbara County, having found many similarities with Hemel-en-Aarde Valley, under his own label — Storm. One more note: Pete poured me a glass of the Storm Pinot Noir Moya’s as I was preparing our meal. He poured the wine in a Riedel Heart to Heart Pinot Noir glass. At the same time he poured himself a glass in his favorite Zalto Denk’Art Universal glass. I didn’t taste the wine immediately after Pete poured it. When I did pick up the wine, I did so without swirling it. The first thing I did was take in the aromas in the wine glass. I couldn’t believe what I detected — cumin. In fact, even though I knew I wasn’t using cumin to season anything I was cooking, I stepped out of the kitchen to take a second whiff of the wine. Same result. I handed my wine glass to Pete and asked him what aromas he noticed and at the same time reached for his wine to give it a sniff. While it was distinctly earthy, brambly and fruity, there was no hint of cumin. We found it so interesting that the Zalto brought out the fruit aromas and character of the Pinot Noir, and the Riedel the earthy qualities of the wine. We noticed the difference whether we swirled the wine in the glass or not. What a fabulous tasting experience! As a nod to the wine’s origins and to the simply delicious pairing, I’d say the pairing was heavenly! The flavors of peas and onions together is always one of my favorites. The roasted butternut squash reminded me of those candied yams that I’m so fond of. The seared duck breast was reminiscent of dark meat turkey with plenty of texture and flavor. Even the blackberry reduction, which I added as an afterthought, was a delicious stand-in for cranberry sauce. 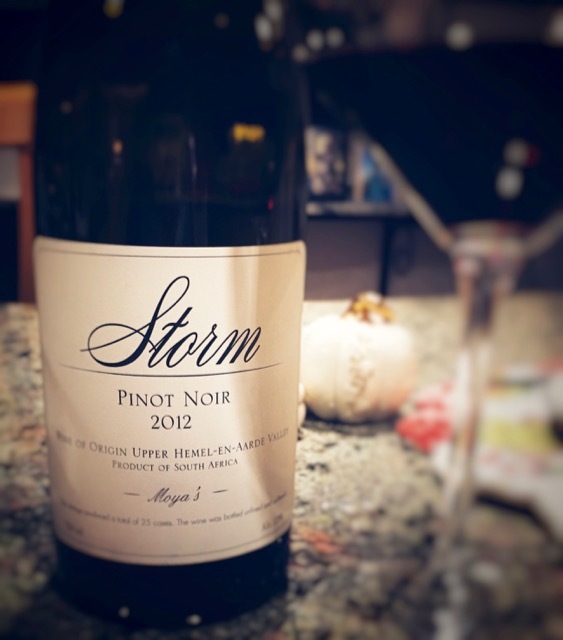 The Storm Pinot Noir Moya’s supported all of those flavors and lent some of its own — fruit, earth and spice. Pete and I enjoyed this simple, but elegant meal so much that neither of us missed dessert, which I decided not to prepare. 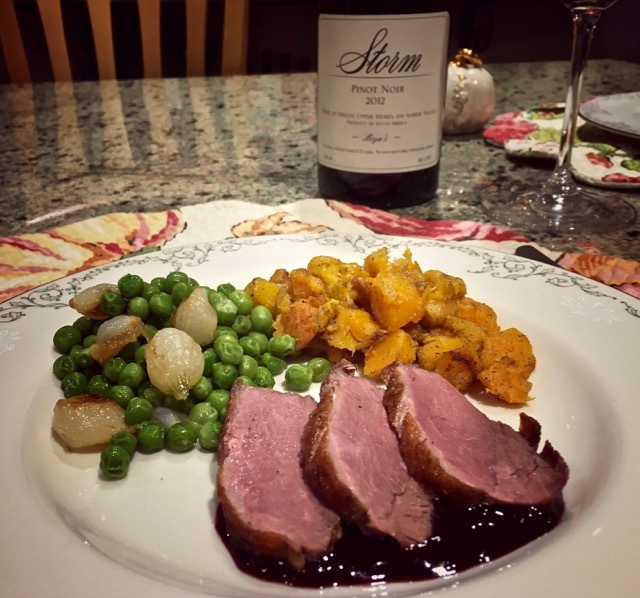 Honestly, we just reveled in the flavors of the meal and the elegant complexity of the Storm Pinot Noir, taking our time to enjoy all of the flavors. Instead of dessert, we enjoyed a second glass of Pinot Noir. I think not making dessert was a brilliant decision! With regard to leftovers, we had only a few slices of duck breast left, just enough to prepare a sandwich for lunch the next day. To see what our fellow bloggers cooked up for their Creative Thanksgiving Wine Pairings, read their blog posts below. Be sure to check out all these Creative Wine Pairings for Thanksgiving! Join our live Twitter chat on Saturday, November 14, at 8 a.m. Pacific Time. Just tune into the hashtag #winePW. This will be a great chance to ask your Thanksgiving wine pairing questions, and share what you know! If you’ve come to us after November 14, consider joining us for #winePW on December 12, focused on “Sparkling Wine and Festive Holiday Dishes”, hosted by Cindy at Grape Experiences. You can get a full listing of past and upcoming Wine Pairing Weekend events here. Beautiful pairing. I love that you opted for duck! It looks like a wonderful meal! Thanks, Sarah. I was a bit nervous to cook duck but it worked out beautifully. Cheers! great description how just changing up the glasses allowed you to discern various nuances of the wine! Sounds like a wonderful pairing. Thanks, David. It was really delicious. Thanks so much for getting this group together. It has expanded our food and wine horizons! Cheers! Your duck breast looks perfect. I’m known for cooking mine too long. I have very limited experience with SA Pinot Noir. How interesting. Thanks, Jade. 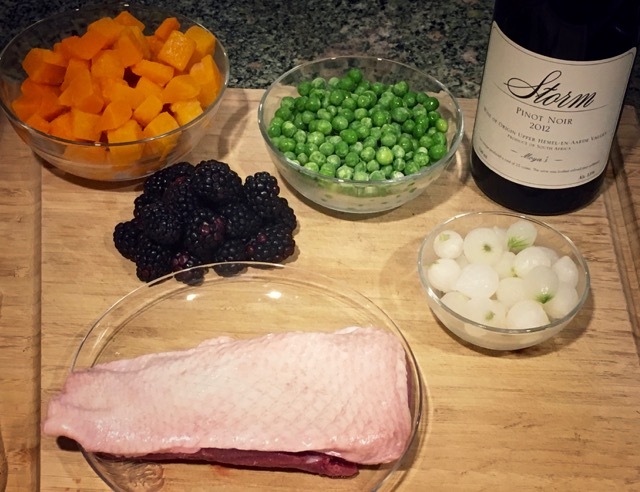 I had fun with this pairing and look forward to preparing duck again…and tasting more South African Pinot Noir! Cheers! Wow! Amazing dish and pairing Nancy! Cumin on the nose for the Pinot huh? Nice! Sounds like an amazing wine! Thanks, Martin. It was a wonderful pairing. The wine was lovely. Cheers! Cumin, how very interesting…this may be the wine we are looking for to pair with Indian cuisine. It was such an interesting, and delicious Pinot Noir. Thanks for your comment, Wendy. Cheers! Oh my! blackberry reduction! YUM! and butternut squash, I’m drooling! How cool of a tasting experience. Recognizing that the glass brings out different aromas. I just posted a blog about how the shape and size of the glass matters. You got to experience it first hand. Yes, it was an amazing tasting experience. Thanks, Lori. Thanks, Chris, for the recipe suggestion. Sounds interesting. I do enjoy wilted lettuce. Cheers! I love that you skipped the turkey. I always try to do something unique as in not turkey! I can’t wait to track down that wine. Thanks for sharing. Thanks, Camilla. It was a fun challenge. Cheers!